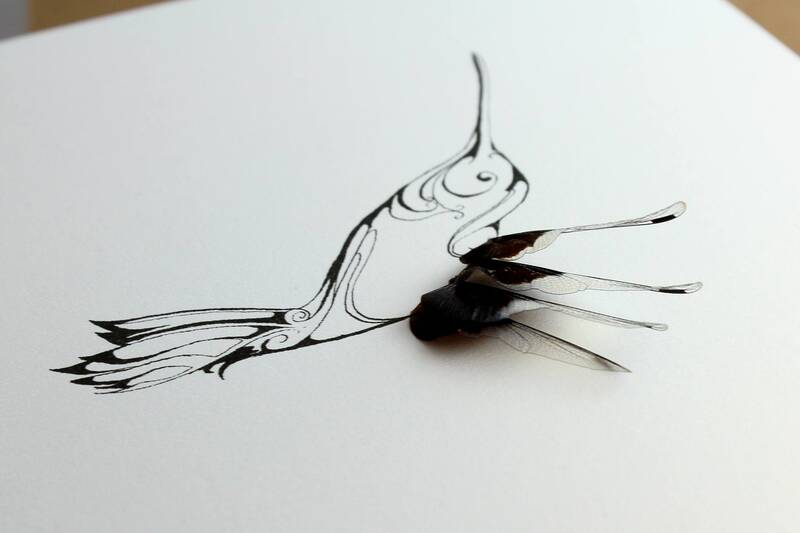 Framed print of original ink drawing by Holly Ulm with a real butterfly wing giving flight to this hummingbird. All images are archive quality inks, and card stock. Paper has a shimmer to it making image appear more black or grey from different angles and under different lighting, lending itself well to the iridescence of the butterfly wing(s). Each piece is one of a kind, and much prettier in person. Check our reviews. You will not receive the exact wings shown. Standard, Special, and Rare wing choices reflect the cost of our purchasing the specimen. Standard Wings include many gorgeous types of wing sizes and colors. Generally they are non-metallic species. Special Wings include blue morpho butterflies, some giant moths, and other metallic blues species, plus a changing variety of other colors and sizes. Rare Wings are truly rare, with very limited options, and quantities. We are happy to honor specific wing requests whenever possible for a $5 custom work fee. Select the Request Wing option, and drop us a note at checkout with your specific requests. All frames are handmade by a disabled Veteran in Minnesota. Frames are solid pine wood, painted black. All components are made in the USA. All frames are approximately 1.75" deep. Choose your size: 4x4, 5x7, 8x8, or 8x10. These are the approximate size of the inner image in height and width, not the outer frame dimensions. The 4x4 and 5x7 will hang, or sit on a shelf. The 8x8 and 8x10 standard sizes are made to hang on a wall. For a shelf-sitting 8x8 or 8x10, there is an option for a deeper fame, which is approximately 3 ½" deep. The deeper frame can also be hung on the wall. Each frame is handmade. Expect small variances in frames. Custom sizes, materials, and finishes can be requested. Your photographs, drawings, or silhouettes can be used for customized butterfly wing art. Simply request custom work from this listing, and tell us what you have in mind. Most of our specimens are purchased through conservation groups around the world working to repopulate and rebuild habitats while generating income from deceased specimens. We also work with a growing number of donated specimens. We can also preserve your specimens into art.